Lancing put seven past Greenwich Borough to see off a division-higher side in the FA Cup for the second round in succession yesterday. Forward Charlie Pitcher was lethal in front of goal, netting four times before being replaced after 65 minutes, while Matt Daniel (two) and Jack Rowe-Hurst also struck as Lancers came from behind to wrap up a stunning 7-3 preliminary round triumph at league above Bostik League South East outfit Greenwich. Laurent Mendy fired the hosts ahead after 24 minutes but three goals in nine minutes before the break saw Lancers go in leading 3-1 at the interval. Lancing then blew Greenwich away, netting four times in seven second half minutes to open up a 7-1 advantage. Borough did manage to pull goals back through Timileyin Toluwanile and Teshuane Tyreece Walters but impressive Lancing booked their spot in the first round qualifying and secured £2,890 in prize money. Lancers knocked out Greenwich’s league rivals Haywards Heath Town in the previous round and first team coach Mark Pulling feels the FA Cup wins this season show what the club’s new-look team are capable of. He said: “It was a well deserved victory, everything seemed to come together on the day for us. 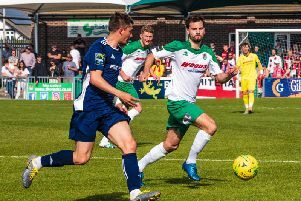 “We’ve shown in this round and the previous round of the FA Cup, when we beat Haywards Heath, what we are capable of as a team. “Performances have been mixed so far this season, which I think you are going to get when you’ve got a new team - which we have - and Ash (Bailey; Lancing manager) and myself coming in to the club. “Charlie (Pitcher) was brilliant on the day and he’s getting fitter and better all the time. The team really stood up, going to a team from a league above and reaching the next round of the FA Cup. Lancers wasted some early chances and Mendy made them pay, firing Greenwich ahead after 24 minutes. Pitcher got his first of the afternoon four minutes later then netting again ten minutes before the break as Lancers took the lead for the first time. Daniel got a third two minutes after to put Lancing in control at the break. Rowe-Hurst extended Lancing’s lead further six minutes after the restart, sparking a crazy seven minute-spell. Pitcher completed his hat-trick and got another, while Daniel got his second in the space of seven minutes as Lancers led 7-1. Greenwich were reeling but did manage to pull goals back through Toluwanile and Tyreece Walters before the end. Those were just consolation strikes with Lancers recording a memorable FA Cup victory. LANCING: D’Cruz; Pulling, Bygraves, Sharman, Willard; Saunders, Williamson, Hendy; Daniel, Pitcher, Rowe-Hurst. Subs: Madhlazi (Pitcher, 64), Westlake (Daniel, 79), Tredrea (Saunders, 88), Tighe, Gunn, Butler.